The key to any successful QMS is the real-time collection of, access to, and analysis of pipeline data. 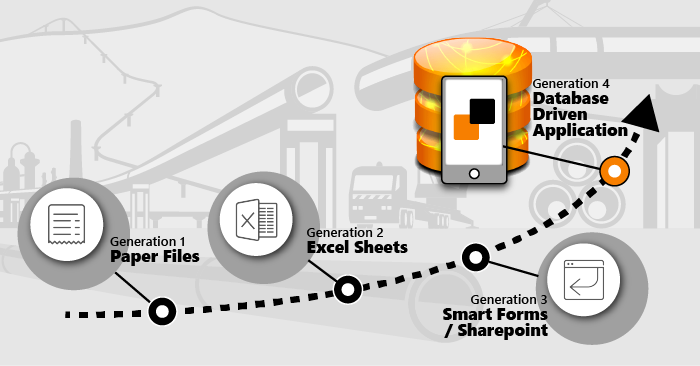 To that end, many pipeline professionals have been adopting the use of “Smart Forms/PDFs” to capture and manage their data. While this technology has some benefits, it is woefully insufficient for the standards of a QMS set forth by RP 1177. The manpower and finances required to locate, extract and utilize information for quality management, engineering assessments, and incident investigations result in significant delays. There are much more advanced technologies available today for the purposes of quality management. Namely: 4th Generation (4Gen) technology. Smart Forms/PDFs are essentially just that – “smart” versions of PDF documentation. They give the user the ability to edit a pdf file with the same freedom as a spreadsheet, word, text or jpeg file, while providing security and the ability to confidentially access searchable file content. In contrast, 4Gen technology can automate all of the tedious data capture, storage, retention, filtering, and analysis while users are actively working in the field. In fact, 4Gen software tools exist that can singularly house all data and information issued during the planning, design & verification, contract, materials requisitioning and construction phases of a pipeline project. Essentially, these tools create a pipeline “Digital Twin” – digitizing every phase of the pipeline lifecycle on a secured cloud server with the client given proprietary access rights. Utilizing a cloud-based server to access, store, and revise data as needed, the user has the ability to monitor progress, identify construction quality issues and audit the construction phase on a daily basis. This leads to actionable intelligence for management to identify shortcomings and create improvements in near real-time. In addition, as revisions to construction and quality standards are issued, they can be automatically downloaded to the device. At the end of the day, PDFs cannot communicate with each other. If data from multiple sources needs to be analyzed and measured, timely work to filter and collect the data is necessary. On the flip side, with the right 4Gen pipeline software, quality and compliance metrics across multiple disciplines and actions can be analyzed in real-time as data is entered. Metegrity is a global leader in quality and asset integrity management for pipelines. Their Pipeline Enterprise product is a 4Gen QMS software tool that helps owner operators digitalize all phases of the pipeline lifecycle for maximized efficiency gains and rapid improvements to profitability. They currently protect over $550 billion in assets across 850 facilities worldwide. Stephen P. Webb, P.Eng, is a Mechanical Engineer with 12 years of varied experience in asset integrity services; inspection; engineering, procurement and construction (EPC); and project engineering in the offshore, onshore and pipeline industries. He specializes in pressure vessels and piping systems as well as semi-quantitative and quantitative risk-based inspection assessments. He holds a Bachelor of Engineering degree (B.Eng) from Memorial University of Newfoundland, Canada.